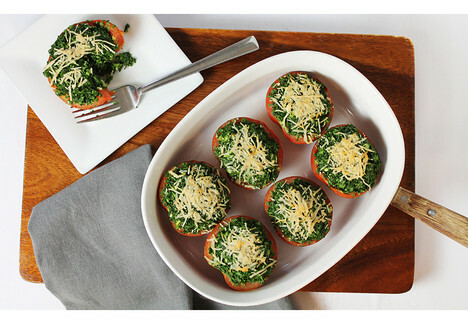 Serve this low calorie cheesy tomato as a side dish instead of creamed kale. In a food processor, chop kale by pulsing in batches until finely chopped. In a large bowl, combine kale, mozzarella, feta, garlic, half & half and lemon juice. Season to taste with salt and pepper. Toss until combined. Cut tomatoes in half lengthwise. Remove seeds with a spoon. Stuff each tomato half with ½ cup of the kale mixture. Sprinkle tops evenly with parmesan cheese. Arrange on a parchment lined baking sheet and bake for 10-12 minutes until lightly browned on top. Serve immediately.